One of the biggest pleasures of being an Osteopath is being present when life really starts – after birth. All that knowing who they are (if I treat in utero) becomes explained and their bodies tell their story of the delivery etc to my fingers. It is very special. I get to meet the face and body and character when they are just beginning to learn what it is to be truly independent – and also see if my knowledge and understanding was right! eg will they be bossy, laidback etc – as I guessed when they were in the womb?! It staggers me that my fingers can be so accurate and perceptive, even after 30 years of working this way. Anyway, I am getting all misty eyed – the real purpose of this post was to explain why a post-natal Osteopathic checkup is SO important. Most adults (Mums) may consider they have had a good / bad delivery based on their experience of it – it can be very different for the baby! The photo above is of Gayle treating a 2-day old baby! All that squeezing, pushing and going round corners, often under tremendous pressure, can take its toll. It may be painful for Mum but she can get pain relief… its not the same for the robust but malleable baby. Once they are born the process of un-moulding from the birth traumas starts, hopefully. There are many factors which have to be considered for this to happen adequately and some are very significant to the cranial Osteopath but often ignored by the medics / midwives / health visitors as to the eventual health and development of that child. Some considerations include: How well they took their 1st breath, how long the delivery was (or wasn’t), if there was intervention. Was Mum relaxed throughout maybe in her own home or stressed by feeling out of control with her own body / the midwife attendants or something else? These are just some of the factors which Gayle Palmer D.O. takes into consideration during her case history taking and subsequent treatment plan. 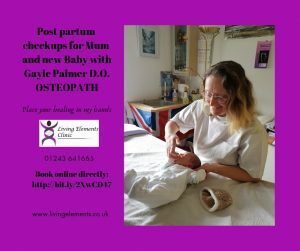 Gayle has yet to meet a baby (and Mum) that has not benefited from some Osteopathy – irrespective of how they were born – “normal” delivery (vaginal), Caesarian, Ventouse, Forceps, with or without pain relief etc. Sleeping difficulties, feeding challenges, restlessness, ease to startle, funny head shape, general irritability – can all be explained due to specific traumas – and with thinking fingers and careful diagnosis and action can be relieved too. So – for your peace of mind and the optimal development of your child – please make an appointment as soon as possible for a post-natal Osteopathic checkup. PS – it is NOT the same thing as seeing your GP / consultant / midwife or anyone else! There is no substitute! or call the clinic on 01243 641665. Your health IS My Priority!